Photo by Krista Tillman and Krista Tillman | The State Press Arizona Board of Regents meeting for an interactive discussion about raising tuition at ASU, U of A, and NAU, Monday, Apr. 20th, 2015, at The Turquoise Room in the MU in Tempe. The Arizona Board of Regents will be reviewing the appointment of Mark Searle to Executive Vice President, ASU campus renovations, and university president performance incentives on Thursday and Friday. ASU will be asking for approval from the board to appoint Interim University Provost Mark Searle to serve as executive vice president and university provost of ASU, according to ABOR documents. Searle has been serving as interim university provost since June and has been responsible for the leadership of all campuses and programs, according to the documents. If approved, Searle's appointment term would begin on Nov. 23, but he would still retain his position as a professor with tenure at the ASU School of Community Development and Resources in the College of Public Programs, according to the documents. His annual salary would be $430,000 and would receive the same benefits as other ASU administrators such as health benefits, sick leave, vacation leave and retirement options, according to documents. ASU will be asking the board to approve a $252.2 million capital development plan for two projects that have already been approved and two new projects. The new projects include the construction of Biodesign C and Gammage Auditorium Rehabilitation. Previously approved projects include the construction of the Student Pavilion and Phase Three of the Sun Devil Stadium Renovation. 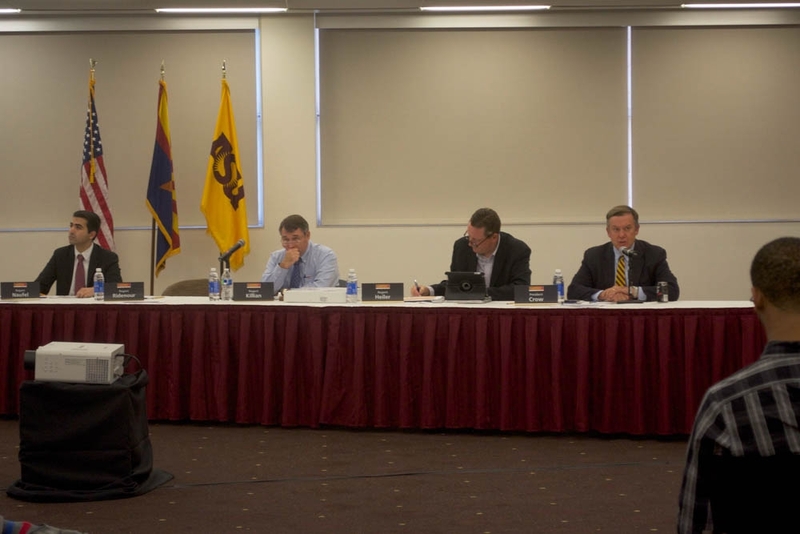 The board will be setting new multiple-year performance incentives that will extend through fiscal year 2018 for ASU President Michael Crow and UA President Ann Weaver Hart, according to ABOR documents. "These multiple-year incentives include enterprise metric goals and university initiative goals," according to documents.